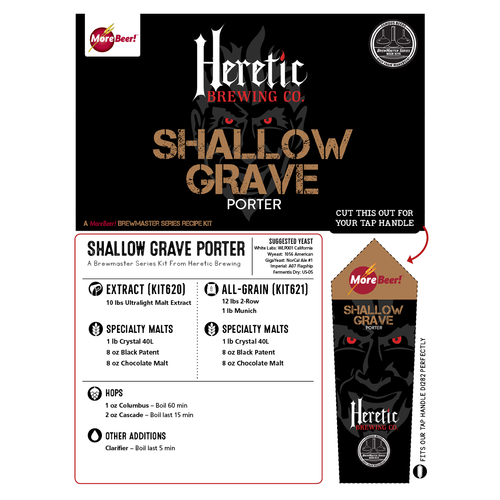 Dark as night, the Shallow Grave Porter is the perfect beer choice for a cool, dark evening. This a big Porter with complex flavors of rich chocolate and caramel followed by a touch of warmth and a light malt sweetness that will leave you ready for the next shovelful. When we say big, we mean big as this beer starts with a whopping 10lbs of malt extract. The complex malt flavors come from a blend of Black Patent, Chocolate, and Crystal malts. Cascade and Columbus hops provide a firm backbone yet a subdued hop flavor. This BrewMasters Series kit comes from Jamil Zainasheff who owns Heretic Brewing and is also a Brewing Network podcaster. Before he went pro he won the California Homebrewer of the Year award twice, the national Ninkasi award for the best homebrewer in country, and hundreds of other brewing awards. He has been a MoreBeer! customer and friend since the 1990's. One of his favorite styles of beer is Porter and he continued to perfect this recipe over many years. We have tasted this product from the original brewer. Loved this porter the first time I made it. I have brewed it several times and am always pleased with the outcome. It was great the first time. Gonna try and hit the mark again! I like dark beers so I thought I'd try this one based off reviews. Brewed it before, and I enjoyed it. I like porters and am trying to get a basis for comparison before I start making my own recipes. My friend brewed and liked the results. By far my favorite Porter kit so far! Actually preparing to brew 2nd batch this weekend. Good depth of flavors and a nice mouth feel! 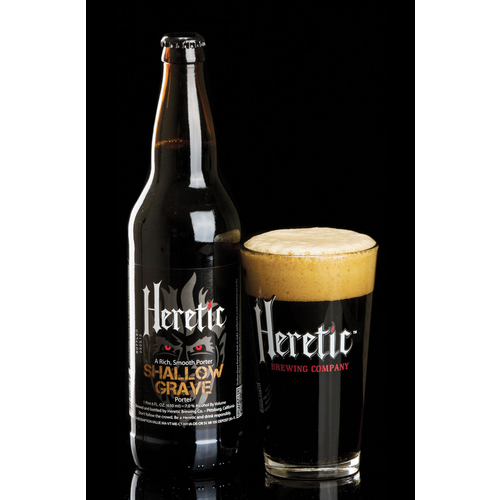 A dark, strong, awesome porter that you will brew time and time again. This beer came out great. My final abv was around 9.4%, but it is still smooth and great. The flavors are all subtle and makke for a great pint. The beer is the hit of the party. I love porters and stouts of all variety. I often times mess with recipes to try to improve them. This beer is perfect as is, I should have bought multiple when it was on sale! As being new to homebrewing, only four previous kits prior to this, I will have to say that this one tates just like something out of a local microbrewery! Very good results. Thanks Morebeer! I really enjoyed this porter, I've made several of them now and this one stands out. I add a hint of black pepper to my batch and it made a big difference on the finish. Great recipe. I have this on tap now. Admittedly I let it sit in the carboy for over two months before I had space on tap for it, but the taste is very nice; creamy with a nice hop bitterness. I threw the priming sugar they sent into the boil as I keg and added some cascade hops from my backyard at 5 minutes. This beer was wonderful. I let it age for several months. It was well worth the wait. I added a little French and American oak which seemed like a nice addition. Overall, I think it is a good kit but needs some tweaking for my taste. This kit is one of the best I've brewed. I added about 12 oz of brewed coffee to the secondary. Great add! This will be a staple for the winter months, as it's definetly a heavy beer! Used the recipe as a base as I normally like to doctor up my kits as I like bold flavors. Added 1 lb of light dry malt extract and a 12 oz bottle of maple syrup. What I ended up with was a souped up porter! Mix between a scotch ale flavor/feel and a strong ale but soft. Also, very drinkable at higher temp like 60deg. My buddies and I presented three beers at a tasting we did and the one I brewed with this recipe was the top pick. Liked the backbone and the malt flavors. Brewed this because I love Jamil's Evil Twin so I thought I'd try it to have on tap during the winter. I couldn't be more pleased with the results: a very rich porter but not so sweet that I didn't want another. This beer was very popular with guests to my bar and it didn't last long. Will definitely add this to my regular schedule. Not sure why craft brews have to adopt "extreme" gimmicky monickers to appeal to beer lovers (seems to have worked on me) but this didn't make me want to dig not deeply and crawl in. It's definitely worth another try with all-grain next time maybe with a little more Black Patent and Chocolate malts. Had to buy this one again! First one did not turn out as well as I would have liked, but it was in no way the fault of the kit. It was good, but had an unlucky heat wave the week after I pitched. I've got temp control now and ca't wait to get this one brewed. I am usually a fan of IPAs but made this beer for something different and i am sure glad i did. It is wonderful, i followed directions to the letter with a full 5 gal. boil. primary for two weeks,secondary for two weeks and keg conditioned two weeks. just tried it last night for the first time and i will be making this again. I bottled my first batch in early march and I opened a bottle every two weeks; it is still getting better. While it is not the heaviest porter ever made, it does have a nice balance and flavor. Recommend bottle conditioning for at least 6-8 weeks. Starting my second batch soon. We have brewed this a few times and it has never disappointed. 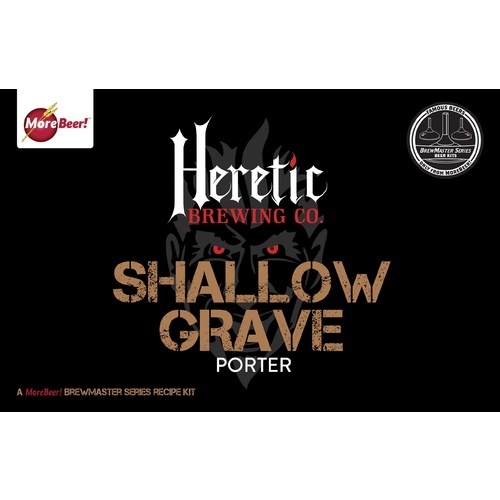 I have been fortunate enough to taste Heretic's Shallow Grave from the bottle and from the tap. I like them all, but I actually think the home-brewed version is better than the commercial bottle. Nice dark roasty malts balanced nicely by some significant hop action. At 7%abv this is not your grandfather's porter. I've had good luck with WL English as well as Safale 04 and 05. Will brew it again. I got it on sale, but expected a nice thick porter. Tastes great, just a touch thinner than I wanted. More like a basic porter. This porter is still aging in my cellar...barely. I keep drinking the bottles I'm supposed to be aging. It started robust and sharp, then has mellowed that sharpness into a great complexity. Easy to brew, excellent results. REALLY enjoyed this brew! 7 days in Primary carboy, 14 days in Secondary, yielded 7.2% ABV. Bottled half, kegged other half. Very nice to share with friends around the Xmas holiday season. Hands down the best home Porter kit I've made or tasted to date. Be patient and give it a little time to age. Very complex flavor! The only issue is after brewing this once I want to tweak it a bit and the additional ingredients bring the price above where im normally comfortable. Either way its still a very delicious beer. Had a friend brew this and had to get my own. Still aging, should be awesome. Very nice porter. I don't drink a lot of porters, but I really enjoyed this one. A friend who is a huge porter fan also tried it and really really liked it. I would definitely purchase again.